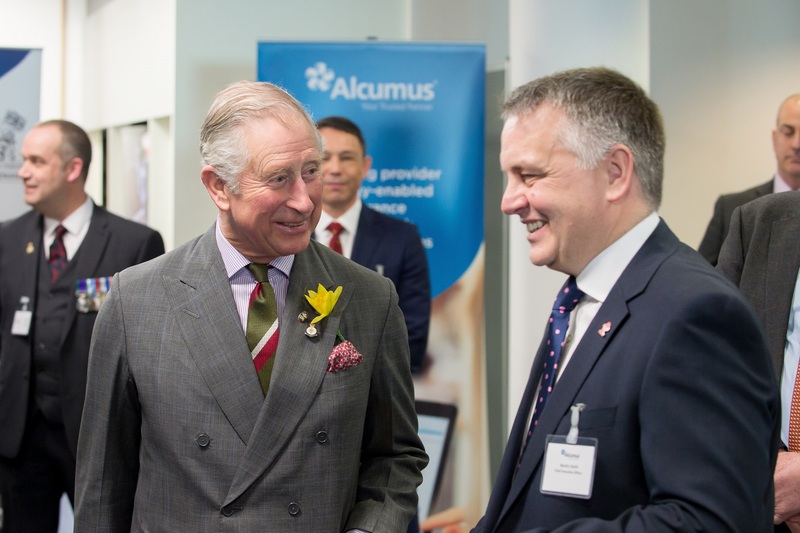 On 24th February 2017, Alcumus, the UK’s market-leading provider of technology-enabled business assurance and compliance risk management solutions, was honoured to have His Royal Highness The Prince of Wales officially opening its new Cardiff head office at Axys House, Parc Nantgarw, Cardiff. This is a momentous occasion for Alcumus as it builds on its strong Welsh links following the acquisition of Santia Consulting and SafeContractor in late 2015. The new Alcumus head office will provide much-needed space for its rapidly-expanding workforce. Alcumus also has offices in Aylesbury, Manchester, Huddersfield and Stratford-upon-Avon. Amongst others invited, local dignitaries included Mrs. Kate Thomas, Lord Lieutenant for Mid Glamorgan, Mr. Gwyn George, High Sheriff of Mid Glamorgan and Councillor Rhys Lewis, Mayor of Rhondda Cynon Taff County Borough Council. Alcumus has pledged to support the Armed Forces Covenant. Alcumus recognises the value that serving personnel, reservists, veterans and military families bring to its business, and upholds the principles of the Armed Forces Covenant by supporting the employment of veterans young and old and working with the Career Transition Partnership (CTP), in order to establish a tailored employment pathway for Service Leavers. Alcumus also strives to support the employment of Service spouses and partners and endeavours to offer a degree of flexibility in granting leave for Service spouses and partners before, during and after a partner’s deployment. Commenting on the Armed Forces Covenant, Martin Smith said: “Alcumus is incredibly proud of the fact that 10% of our workforce is ex-service men and women”. Alcumus has partnered with the University of South Wales to assist with their new venture: USW Exchange. This emerging opportunity is designed to facilitate collaboration through providing an inspirational setting to host businesses who wish to hold workshops, business activities, networking events and also to meet clients. The USW Exchange opens at the South Wales’ Treforest Campus in June. Alcumus has an ongoing relationship with USW, with 12% of its employees having attended the University of South Wales, including Martin Smith, Alcumus CEO, who last year received the Distinguished Alumni Award from the university. Smith commented, “With the new Alcumus Head Office being close to the USW Exchange, we are in an ideal location to work together and support each other going forward”. Alcumus is celebrating the start of a new partnership with The Prince’s Trust, the UK’s leading charity for young people. The Trust is introducing Alcumus Info Exchange, its innovative software solution, as part of a three-year benefaction agreement. This three-year partnership will see The Prince’s Trust benefit from a bespoke web-based information management system that will streamline its health, safety and compliance management procedures. The introduction of the Alcumus Info Exchange solution will free-up valuable time and resource, allowing the charity to focus on its core commitment to ‘giving young people the practical and financial support they need to stabilise their lives’. Over the last 10 years alone, The Prince’s Trust has helped to return £1.4 billion in value to society through its help of young people.